Put all your social media needs on one page in iGoogle. There are gadgets for almost every site out there. Social media sites are supposed to help us keep in touch with our friends, get organised and stay updated. There are so many to choose from now though - and so many friends to keep happy - that it's an overwhelming task keeping them all current. We say, work smarter - not harder. Here are 10 ways to make your online social life easier and still be the life of the party. The easiest way to edit then batch upload photos to Flickr has to be Windows Live Photo Gallery. Drag photos to the application, then crop or filter as required. Select the images you want to upload then go to 'Publish' and choose 'Publish on Flickr'. Once authorised by the Flickr API, you can create new albums for your pictures and resize them on the fly. Adding videos to YouTube one at a time is a pain in the proverbial, so use the new Multi-Video Upload feature. You'll need Google Gears installed - Google's web application sandbox. Click on 'Upload' and choose the 'Bulk Upload Plugin' link. You'll be prompted to allow the site access to Gears when you click 'Add Videos to List'. You can now select multiple videos in the Browse dialogue, adding as many as you like in one go. Why not cut down your Facebook time and get your Twitter feed to take care of your status updates? Go to apps.facebook.com/twitter to install the official application. What's more your Twitterless friends can find out what you're up to as well. What's that? You need to update your status on multiple sites? Alright then - HelloTxt can take care of that. With one login you can update Facebook, Twitter, Bebo, LinkedIn, FriendFeed and a bunch of others. There are other microblogging sites - but Twitter's the king. Thing is, those messages come in thick and fast once you have a decent sized group of friends. Enter TweetDeck. This cross-platform, Adobe AIR app connects to your Twitter account, allowing you to filter the stream of Tweets into manageable categories - either by group or search keyword. Facebook toolbar for Firefox helps you update Facebook, without going to Facebook. You'll get notifications sent to your browser when someone sends you a message, updates their page or pokes you. More pertinently, you'll be able to update them - and share web addresses with your chums without leaving the page you're on. Choose NetVibes as your start page if you're juggling several social media accounts hungry for daily updates. Sign up then go straight for the 'Add Content' tab. There are update tools for MySpace, Bebo and, of course, Facebook. If you've already got a Gmail account - or even if you haven't - iGoogle's a cleaner, leaner alternative to NetVibes. Go to www.google.com/ig and login in with your Gmail account details. Next, click 'Add Stuff' and start searching for tools to make your social media updates easier. You'll find gadgets for Facebook, Twitter, Flickr and many more. Like any good countdown, we're leaving the most powerful tools until last. Digsby's an industrial strength combo of cross platform instant messenger and social media status updater. 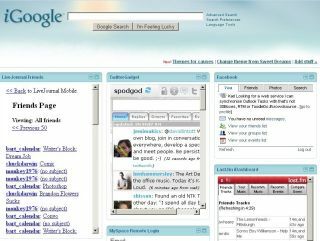 Connecting with Windows Live Messenger, Google Talk, AIM and Yahoo - it also boasts Facebook, Myspace, Twitter and LinkedIn status update tools. For industrial strength networking, download Flock. It's built on the same code as Mozilla Firefox, but boasts a shell that helps you stay connected to your favourite social media sites all day long. With updates delivered direct to your sidebar - post to blogs, change your status and upload videos all from the same place.